Tel Aviv, Dizengoff: City residents are reminded that Permits to park wherever the hell they please are now available at all Israel Post locations. The permits, which render a vehicle immune from such mundane concepts as municipal ordinances and the laws of physics, allow the holder to park his or her car totally on the sidewalk, halfway between designated spots, or basically anywhere they think they can fit their vehicle on any given day. The Daily Freier walked down to the Post Office by Dizengoff and Nordau to see for ourselves and maybe even pick up a permit or two. Israel Post Regional Manager Yossi P. greeted us and walked us through the permit concept. “This is a real moneymaker for Cities and Towns across Israel. Basically, since everyone just does whatever they want with their cars anyway, why not make a few Shekels for Schools and Youth Sports Clubs? The Post Office collects a 5% Commission so it is a real win-win. But as great as this program is, we strive to ensure that it does not take us away from our Core Competency of delivering the Mail efficiently and accurately.” Then he started laughing. As we were speaking, Local celebrity Moti C. stopped by to hit on chat with the ladies who work at the Post Office after parking his truck diagonally onto the sidewalk by the bus stop. When the ladies told Moti that he may want to buy a permit today, he reminded them that he won a contest and was thus exempt from Parking Laws for a year. 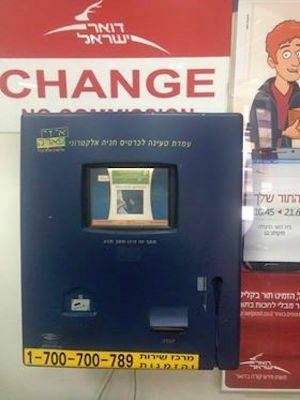 Permits cost 250 Shekels for 6 months, or 400 Shekels for the year. While the sales campaign was considered a huge success, some city residents also offered suggestions and advice to improve the program. Alert Local Ronit S. asked Israel Post if maybe they could sell permits next year to exempt electric bicycles from stopping at red lights or for people in their way.